Peach has been kidnapped by Bowser Jr. Mario gives chase across the Mushroom Kingdom to save Peach in a return to his 2D roots. Run and jump through each of the levels and reach the flagpole at the end within the time limit. 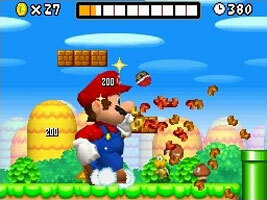 As well as the classic Super Mushroom, Fire Flower and Starman items, Mario can now grow to a super size with the Mega Mushroom, shrink with the Mini Mushroom or use the Blue Shell to spin along the ground and take out low-lying enemies and blocks. Every stage has three hidden Star Coins. Collect them to open new pathways on the map. Certain stages also have secret exits that lead to new areas. When you have completed all of the levels in the game, a Mushroom House appears in World 1 where you can buy custom backgrounds for the touch screen. One design can't be purchased until you have collected all of the Star Coins in the game, which features 8-bit sprites from the original Super Mario Bros. When the multiplayer game is loading, the loading screen features classic 8-bit Mario and Peach from Super Mario Bros. Peach releases Super Mushrooms and Goombas that make Mario grow and shrink accordingly. Sometimes she will send two Super Mushrooms in a row, making Mario huge.